This happy Easter arrangement has red wine, chocolate, cookies, a chocolate bunny and a decorated egg cookie, all in a holiday gift box! You must be 21 years of age or older to purchase or receive a wine basket from us. Due to state restrictions, we cannot ship wine to IN, KY, MS, ND, TN or UT. This basket must be signed for by an adult over 21. If you are sending a basket requiring an adult signature and are not sure if anybody will be home to sign for it, we strongly suggest you ship the basket to a work address, or to an address where somebody over 21 will be there to sign for it. Collegiata Montepulciano d’Abruzzo from Italy is a ruby red wine, made from Montepulciano grapes. It boasts an aroma of ripe cherries with nuances of almonds. Goes well with pizza, rich pasta dishes, especially meat and spicy sauces, hamburgers and poultry, including turkey, and sharp cheeses, such as pecorino. All baskets shipped same day if we receive the order before 3 P.M. EST, Monday-Friday (except for legal holidays). 1 to 5 business days, depending on location. Delivery times are estimated. To calculate the approximate Ground delivery transit times, click on the color-coded delivery map. Anything going to Alaska and Hawaii must be shipped Express, either 2-day or Overnight. For any additional shipping info, please click on Shipping. We will deliver same day by van within select parts of NJ if we receive the order before 10:30 A.M. EST, Monday-Friday (except for legal holidays). Saturday delivery may also be available during holiday seasons. Van orders received after 10:30 A.M. EST will be delivered on the following business day. Orders for future van delivery service can be placed as well. Deliveries are limited to certain zip codes within New Jersey. The delivery cost is calculated based upon the weight and size of the package, plus the destination zip code. For a list of van delivery zip codes, please click here. You must be 21 years of age or older to purchase or receive a wine basket from us. Due to state restrictions, we cannot ship wine to IN, KY, MS, ND, TN or UT. 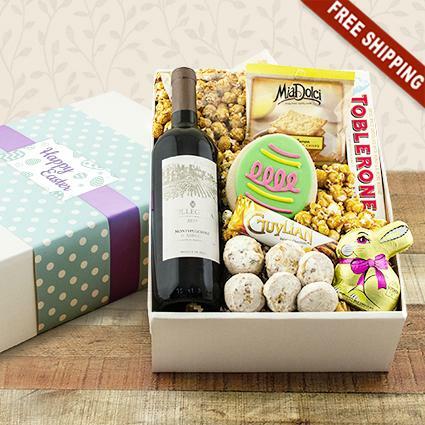 If you are sending a wine basket and are not sure if anybody will be home to sign for it, we strongly suggest you ship the basket to a work address, or to an address where somebody over 21 will be there to sign for it. There is a $5.50 Adult Signature Fee which is already included in the shipping price.